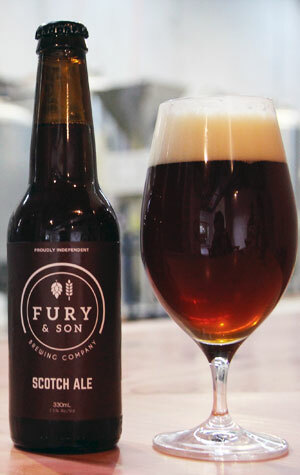 Having worked together to come up with a core twosome to represent Fury & Son, Andrew and Reno Georgiou let their brewer decide where he wanted to go for his first seasonal. As they were coming into winter, it was always likely to be something bigger and darker. And, if you know Craig Eulenstein, there was always a good chance it would end up something like this. In his time at Mountain Goat, he brewed a few beers going under the name The Craig and all, in one way or another, put malt front and centre. Then, while at The Monk, of the beers of his that we got to sample it was the Vintage that was the standout: a peated, hearty Scotch ale. Here, the peated element has been reined in a little so there's just a hint of smokiness apparent; instead it's rich toffee, treacle and raisins that take centre stage in this big, glowing chestnut coloured brew, with a slight boozy tingle to remind you it's a sipper. Ideally with that sipping done by an open fire.